A night light is a practical touch to add to your home whether you have children or not. The ability to see where you’re going in the dark without needing to turn on real lights is simply convenient. The only thing that takes away from the practicality of some night lights is their need to be on all the time. That can lead to a spike in the electricity bill! Check out the 10 best motion sensor night lights reviews to find a model that will work for your lifestyle. How Does a LED Motion Sensor Night Light Work? Before you invest in your own motion sensor night lights, it’s helpful to understand exactly how they work. Traditional night lights are turned on at the end of the day as the sun goes down and you’re nearing bedtime and turned off when you get up in the morning. While this seems logical enough, it creates the problem of wasting energy without cause. Each type of motion sensor works in a specific way to respond to motion and trigger the activation of the sensor. 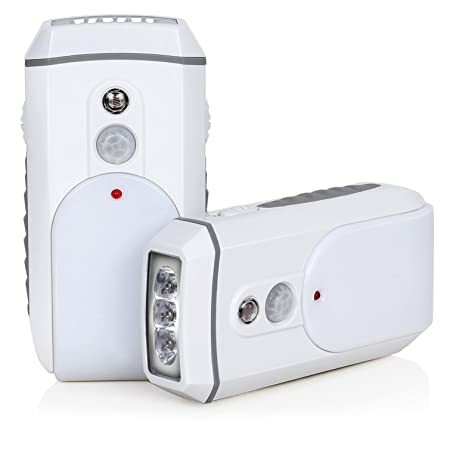 Plug-In or Battery Operated: One of the things to think about during your search is whether you want a motion sensor night light plug-in or a motion sensor night light battery operated. While this may not seem like such a critical decision, you need to keep your electricity bill in mind. You will be able to find plug-in models that are energy-saving, but if you’re looking to minimize electricity use as much as possible, it’s better to go with a battery operated model. Durability and Safety: when choosing your night light, be sure to pay attention to the type of material the light’s case is made of. This will indicate how sturdy the night light will be and whether it will last over time. The material of the case can also tell you if it is equipped with fire safety protection. 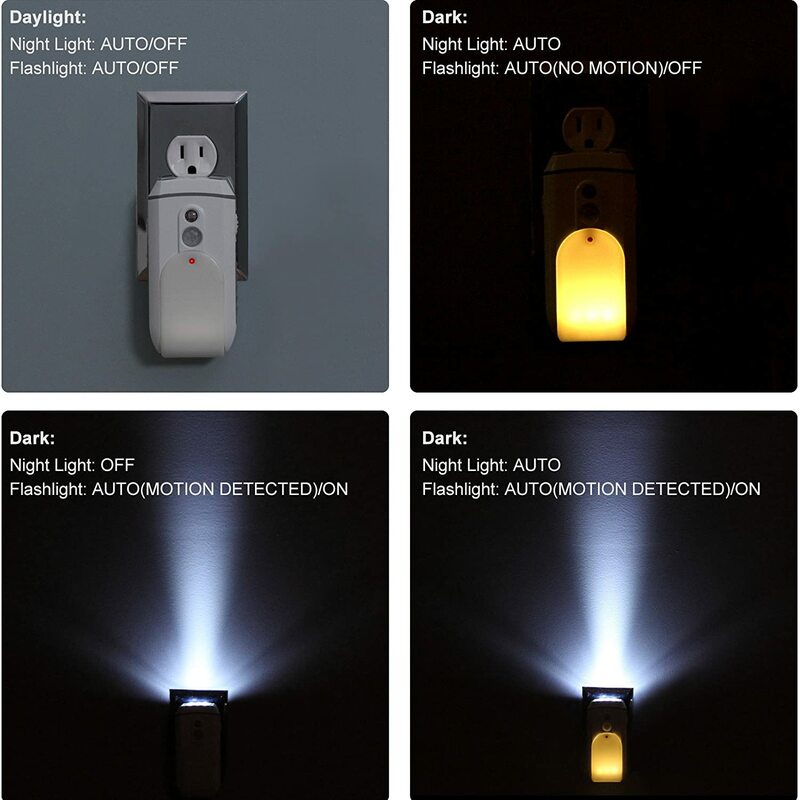 Price: motion sensor night lights are available in a wide range of prices. Think about your budget beforehand as well as how many lights you would like to add to your house. The Mr. Beams Motion-Sensing Nightlight is a great option to add to your home. 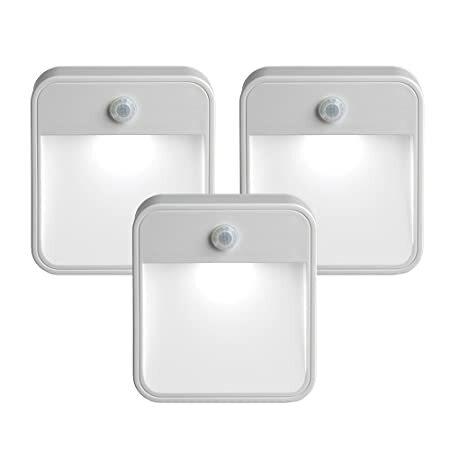 This pack of 3-night lights allows you to brighten different areas of your house. You can use these night lights both inside and outside, depending on your needs. These Mr. Beams motion sensor night lights are super easy to install and run on batteries, so you can move them to any spot where you need light. One set of AA batteries will provide 80 hours of light. This night light uses super-bright LED light bulbs which last for up to 50,000 hours and will remain off during the daytime. 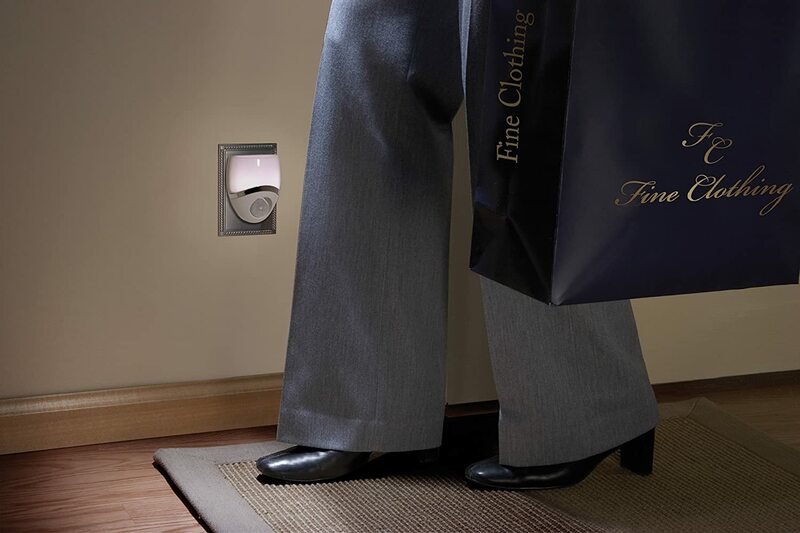 The motion sensor installed in this night light will detect movement from up to 9-feet away to trigger the light, and will automatically turn off after 30 seconds of no movement. 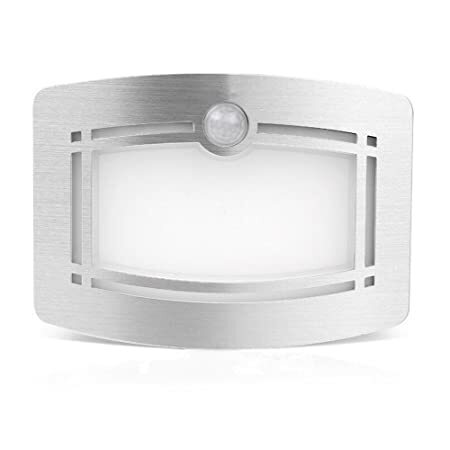 The light casing is made from durable plastic and metal. If you’re looking to invest in night lights that are affordable and will help you light up your whole house at night, look no further. 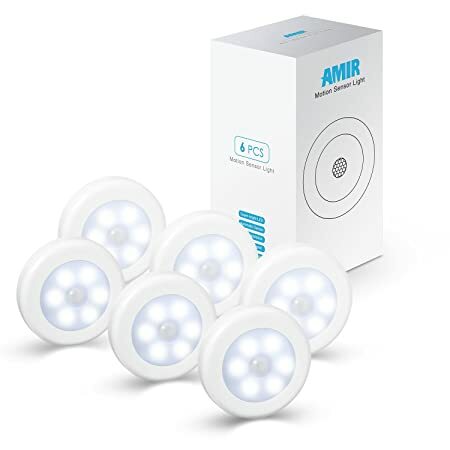 The AMIR Motion Sensor lights are easy to use and are designed with double-sided adhesive pads so you can stick them wherever you need them. This night light uses a Passive Infrared motion sensor to detect movement within 10-feet for automatic turn-on. 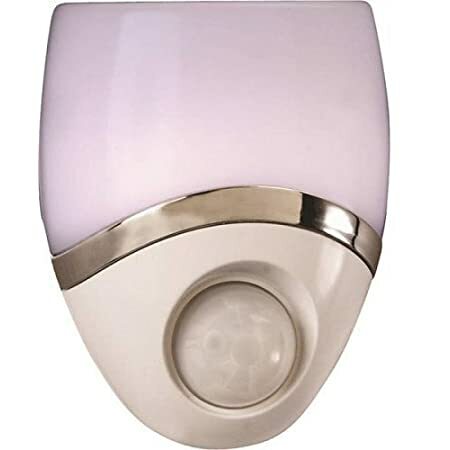 These motion sensor night lights are battery operated, which makes them ideal for outdoor use or use in parts of your home that has limited electricity access. This six-pack of night lights will keep your house super bright, as the night lights use LED bulbs. The AMIR night lights will not turn on if sufficient light is detected, so just one set of batteries will last for quite a while. One of the main places which needs to be lit up at night is the bathroom. 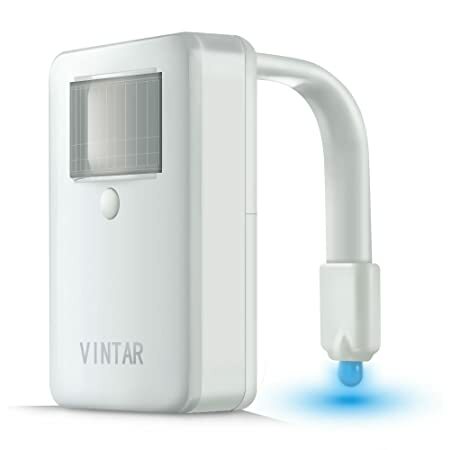 The Vintar Motion Sensor Night Light is an innovative and unique invention for just this need. This night light is designed to hang over the toilet bowl. 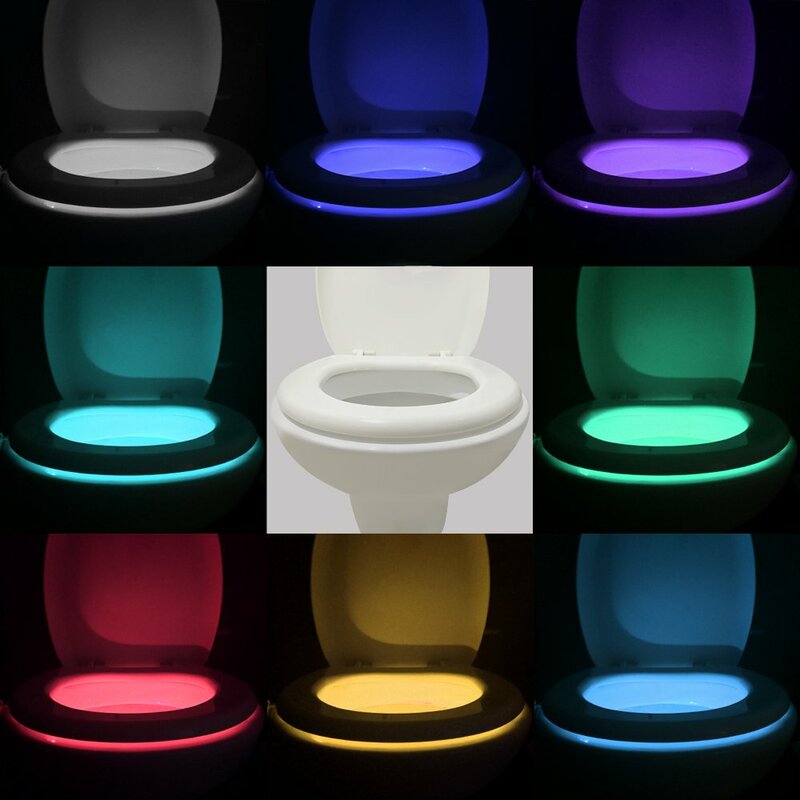 With 16 different colored LED lights and 5 brightness levels, you can have your toilet bowl light up just the way you want when you visit at night. The night light is made with a soft PVC handle that is flexible to fit virtually any toilet for optimal convenience. The light and color controls place on the outside of the light, so you can change them at a moment’s notice. This motion sensor night light runs with batteries and only activates in darkness. The AmerTac Motion-Activated Nite Lite is an affordable option if you’re looking for a plugin night light. This light has a decorative aesthetic, making it ideal for use in bathrooms, bedrooms, hallways, and guestrooms. 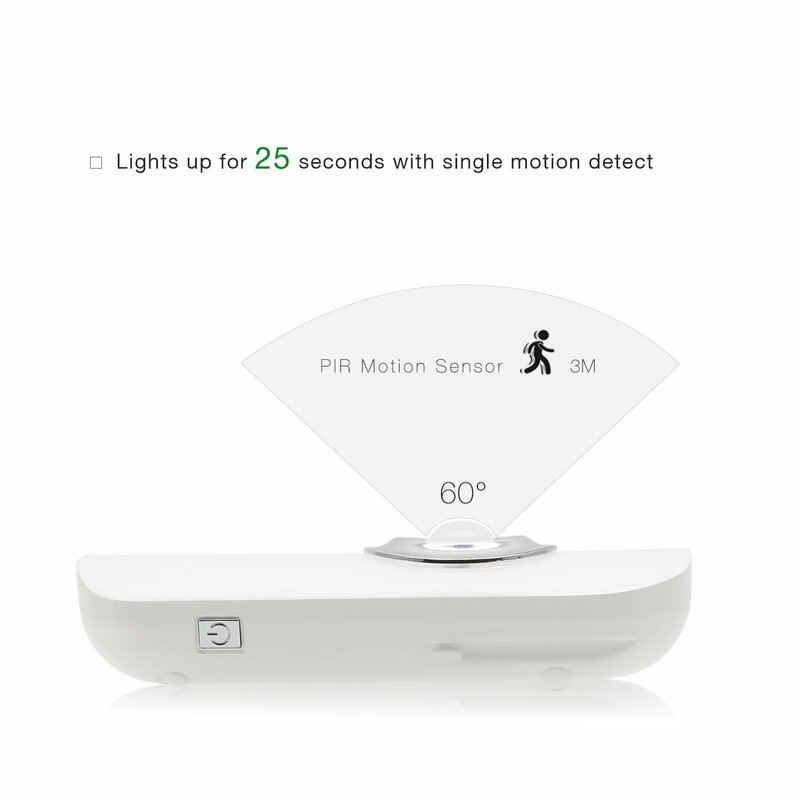 The motion sensor will detect movement from up to 25-feet away within a 100-degree-wide zone. The light will automatically turn off after 60 seconds. 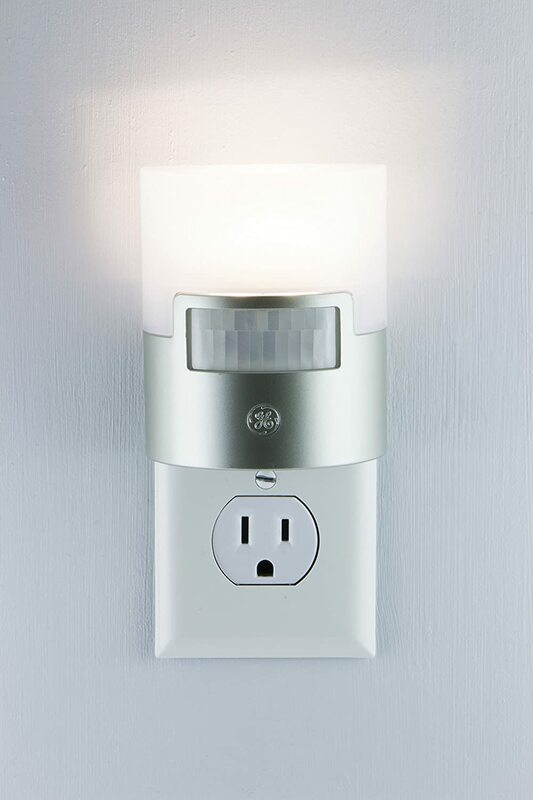 The AmerTac night light will work when plugged into any standard outlet. It uses energy-efficient LED bulbs to save you money and provide a brighter look to the night. If you’re planning to put this night light in a child’s bedroom, rest assured that it remains cool to the touch and is safe. The OxyLED Motion Sensing Closet Lights can be used in any area of your home. Made to provide optimal safety, the casing is designed with premium fireproof ABS material. Not only does this night light sense motion, but it can also sense other light within 3 meters. 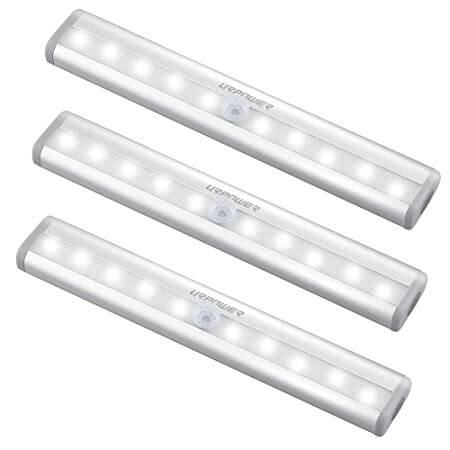 The OxyLED light is super easy to set up. You can either use adhesive pads to stick it wherever you’d like or mount it with screws. What makes the OxyLED night light unique is its size. It is larger than most traditional night lights. This can come in handy if you need to illuminate a larger space or want to make a child feel safe with brighter light should they wake up at night. 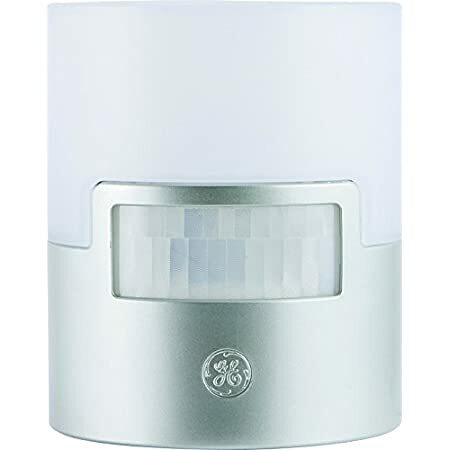 GE is a reliable brand when it comes to electronics, and this motion sensor night light is no exception. This affordable nightlight plugs into any standard plug and uses cool to the touch LED bulbs which provide 40 lumens of soft white light. The night light has a stylish design which complements your home decor. 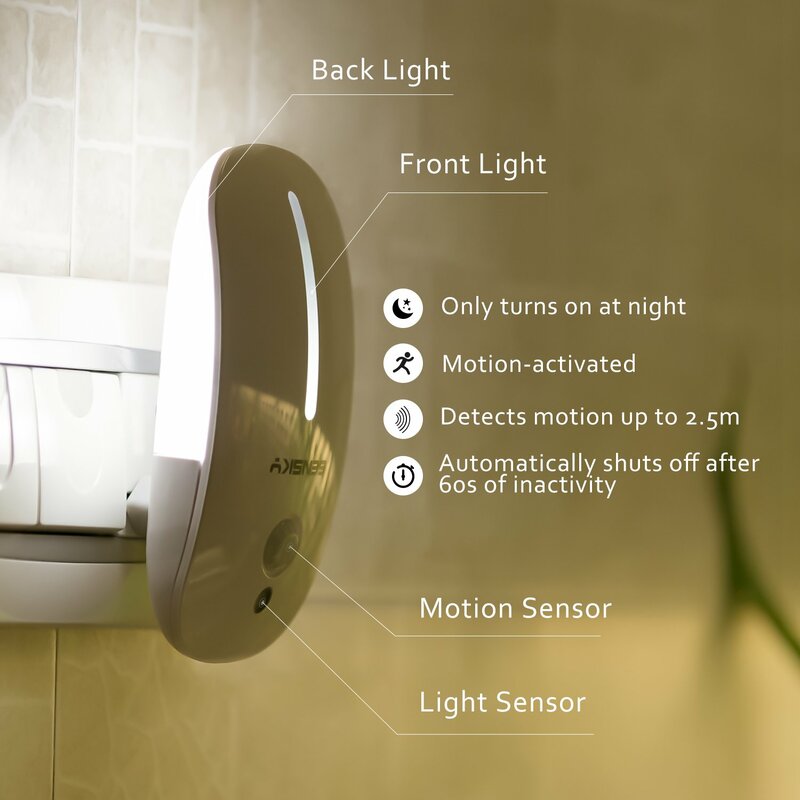 The motion sensor will detect movement from up to 25-feet away, so you will be able to see as soon as you reach the area. If you prefer to leave your night light on all night, you can activate the light sensing mode, which will turn the night light on at dusk and off at dawn. 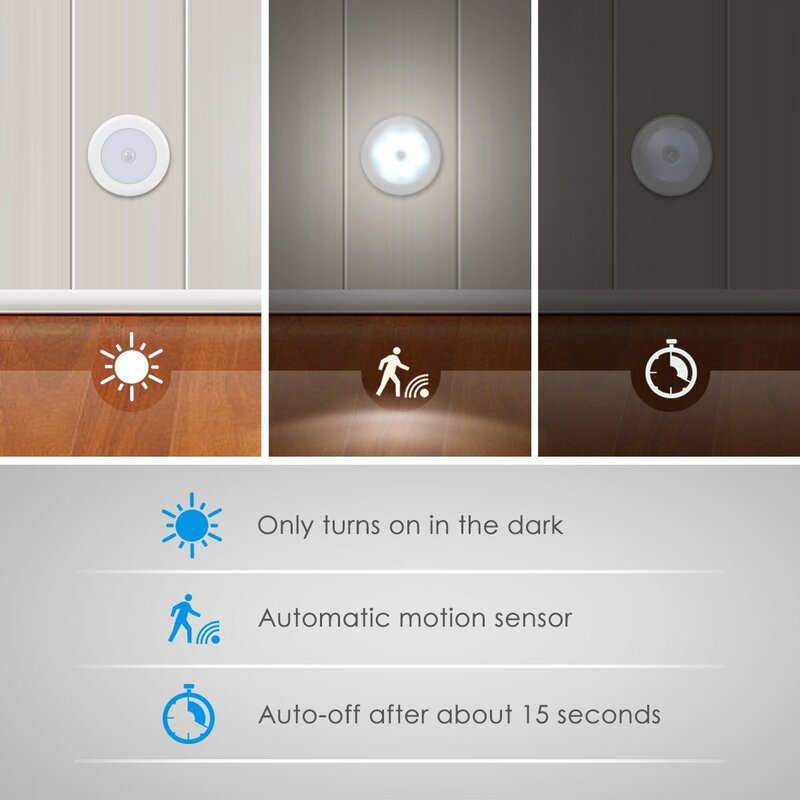 The URPOWER Motion Sensor Night Light is a unique option with its long and slim shape. 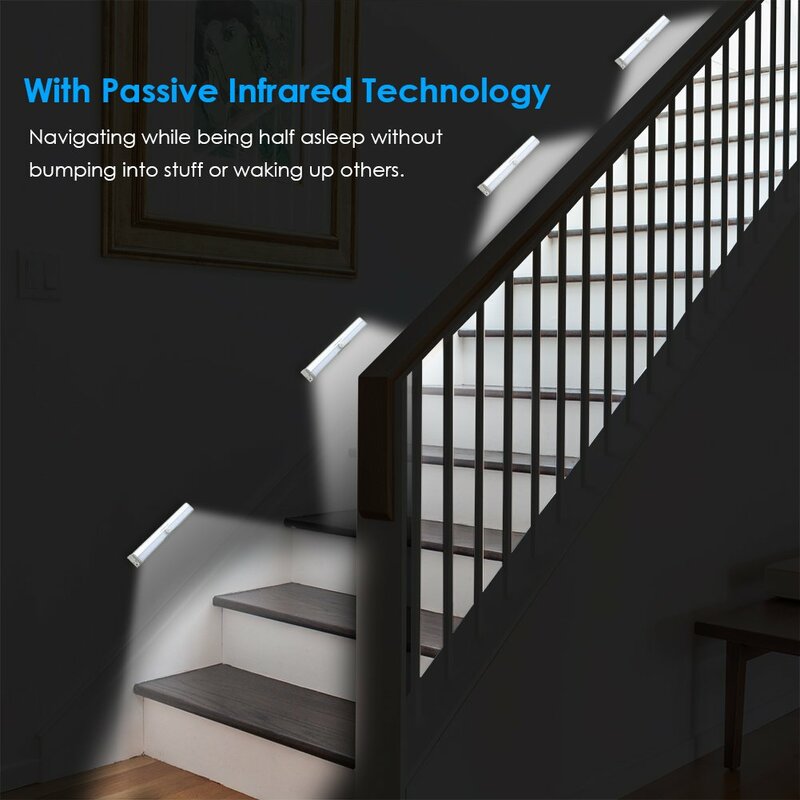 The night light uses Passive Infrared technology for auto turn-on within 10-feet. Each night light contains 10 LED bulbs and get illuminate a large space without difficulty. The URPOWER night light is battery operated and one set of batteries will last quite long. The URPOWER night light is designed with a magnetic strip for mounting in addition to double-sided adhesive pads. This means that you can easily place these night lights wherever you need them. 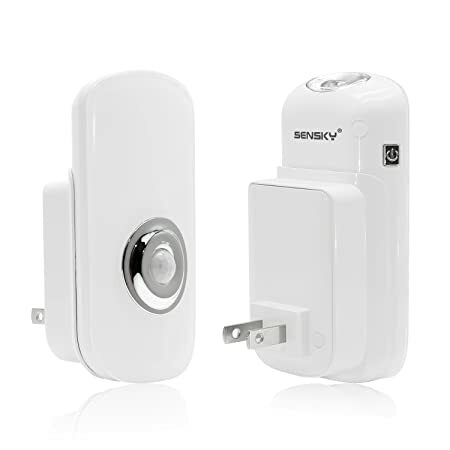 The Sensky Plug in Motion Night Light uses Passive Infrared to detect movement for automatic turn on. This light has various modes you can use, including one mode which leaves a front light on when a room is dim and activates a backlight when motion is sensed. While this is a plugin night light, it is very energy efficient. The sleek model is ideal for use in visible places and the combination of motion and light sensors ensure that you will not find yourself stumbling in the dark. This night light is super safe as it is constructed with fireproof material. Another option from Sensky, this 3-in-1 Motion Night Light is a great option if you’re looking for a multitasking device. Not only will this light keep your home illuminated on a daily basis, but you can use it as a rechargeable flashlight and as an emergency light during a power failure. 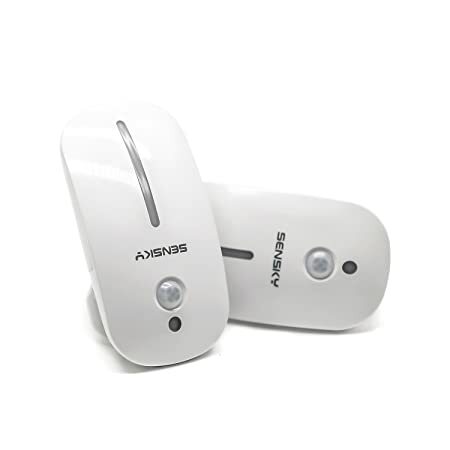 The motion sensor prompts auto turn on for movement detected within 0-3 meters and will turn off automatically after 25 seconds of inactivity. This Sensky light is super versatile and flexible. The charging base plugs into any standard plug. When you want to use the light elsewhere, you can simply take it from the base and bring it with you to another room or even outside. The DEWENWILS Motion Sensor Night Light is another option that provides more than just light in your home. This light can be used as a night light and as a flashlight or emergency light. 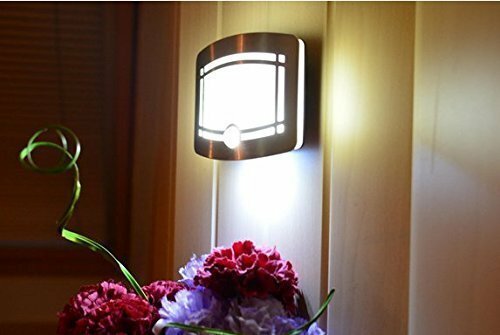 The plugin night light can be used in any room in your house and you will be able to carry it with you to another location, if necessary. The night light gives off a warm LED light and you can programme to turn it on at dusk and off at dawn. With a non-polarity plug, you will be able to use the bottom or top outlet without blocking the other one from use. Motion sensor night lights are a practical addition to any home. They prevent stumbling around during the night without using too much energy. You can even light up your house while remaining prepared for an emergency with a multi-use model. Think about what model best fits your lifestyle and start illuminating your home! Сергей, была собрана информация сайтов и на, что часто обращал внимание и создана по моему вкусу заинтересованности подборка.